As a long-time supporter of Goodwill, both as a donor and as a customer, I was glad to see some of the savvy marketing and new technology that they are using. I was shopping Goodwill and other thrift stores long before Shabby Chic was chic. Back when the economy was growing and conspicuous consumption was the nation’s modus operandi, I was still shopping for a good cause while also recycling unwanted household items for that same good cause. The deals were better for a shopper when I was not in the majority and the demand was lower, but they are still good now, and given the same deal at Goodwill and an overstock store, I will give the business to Goodwill or another non-profit when I can. Russ and I have been on a big Goodwill kick lately. We have opened an account with Etsy for some of our current crafts and plan to expand with time. We have seen a few crafts that are “green” using recycled items from thrift stores to become something else. We are looking for that unique breakthrough idea that sings, and when it sings, it needs to sing “art” and nothing less. It has been a blast so far. 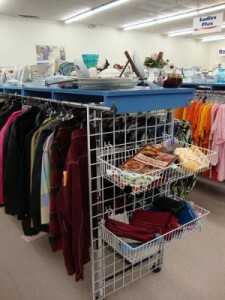 We sought out the Goodwill in Oak Ridge, Tennessee on our recent trip through the area. Would this Goodwill be different? What might we find there in the Secret City? It was a nice store and there was a much larger Science Fiction book section than I have ever seen at any other Goodwill Otherwise there was not too terribly much to distinguish it from other locations. We did find interesting differences in other Tennessee towns. We found some with new stock as well as the regular recycled donations. I asked if new stock was becoming typical and the storekeeper told me that all Goodwill stores in her district carried new stock, that employees went on buying trips and that some merchandise had come from “the shopping network.” This was news to me, though I did not find anything at this location that moved me to the point of purchase. There are a lot of shifts taking place in charity and overstock outlets as the current economic conditions have a larger segment of the population looking for discounts, bargains and other forms of frugal spending options. These shifts have some charity organizations scrambling to replace good that were once donated as seconds, but now have a market in discount stores. At the same time, the price gap in second hand and second quality stores closes in to reflect the greater demand. 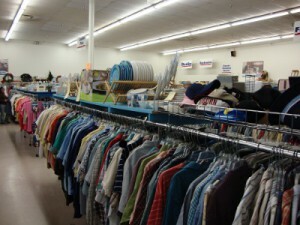 New marketing techniques in Goodwill are well timed to fit in this shifting marketplace. The best store set up that I have seen since this renewed purpose to my old passion has taken hold was in Thomasville, Georgia, a part of the Big Bend (Florida) district. Shelves were custom made here to fit above the clothing racks so that while shopping for clothing, household items and nick knacks were right there calling for attention. In electronics, the televisions sets were running just as they would be in a retail outlet allowing comparison. The aisles all had end-caps with merchandise, just like a regular retail outlet. 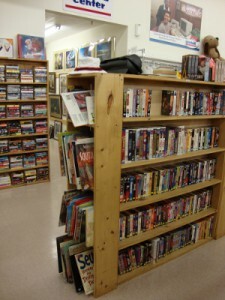 The video, music and other media had shelves custom fit to their size so that the display was easier to process visually and took less space than it would otherwise. I bought a white ceramic owl container because it reminded me a little bit of Woodsy Owl. 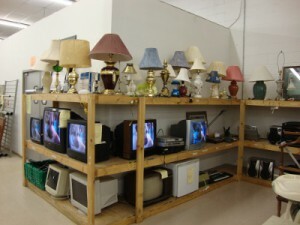 When I went to the checkout and complimented the college student clerk on the set up as the best lay out I had ever seen at a Goodwill (or any other thrift store) he was really psyched. He spoke enthusiastically about the manager responsible for the set up. Apparently he puts these features in all of his Big Bend locations. The part I couldn’t tell just by looking is that this manager keeps track of what is selling and makes sure that there is a proportionate amount of display space dedicated to those items. I was already impressed before the clerk talking! After returning home, I found some other interesting Goodwill news. I saw an internet link to some items that had been donated by the newest owner of a cabin that had once belonged to June and Johnny Cash. The claim to fame caught my attention, but it was also clear that there was no claim that the items had been owned by the Cash family. I followed the link until I saw a site with a set up that looked very much like ebay. There were categorized items with photographs. I did not know that I could shop at Goodwill on the internet! Fantastic! Effective display and effecient use of space. Their 100th anniversary was in 2002 and long before that date, Goodwill became to thrift stores what Kleenex is to facial tissues and Coke is to soft drinks. That is, people often use those brand names as generic, even when they mean to refer to other brands. At seven years into their second century, they seem to be looking forward very well, maximizing their market niche and continuing to do good works. In an ever changing marketplace this is no small task. As fads come and go some things are worth keeping. I hope that after Shabby Chic and “Green” have peaked there will be some follow on that will keep people using common sense to shop at economical places where they can recycle while at the same time support a worthy cause. It just makes good sense to support institutions that meet multiple goals and needs the way that Goodwill and other thrift stores do… and when we figure out that amazing new art form, you’ll be sure to find out about it right here! On a recent trip to Japan I was channel surfing in my hotel. I usually want to be out and about while traveling, but Japanese television is famous for its unique window into the culture and the pretty constant rain was keeping me in a little more than usual. I know no Japanese past domo arigato. When I watch the Japanese language programing, I am for all intents and purposes deaf to verbal language and taking in all of my information in body language, visual ques and sound effects. I watched two programs in this way, guessing what the details might be, when I happened upon Brad Pitt and Quentin Tarentino promoting “Inglorious Basterds” while acting as judges for a Japanese cooking show. I was rapt. Not only was this unique (serious understatement), I was able to understand much of what was being said. American celebrities have long promoted products and shows in markets where their work is pretty much lost to American view. Once, they were able to promote products in a way that would most appeal to that foreign market and never worry about the impression that might give to American viewer because they would not see it. Globalization is making that harder and everything is heard ’round the world these days. I can appreciate how making this kind of a promotional tour is a difficult balancing act. Brad Pitt was amazing, a perfect guest. I was distracted a bit by the prominent goatee and the heavy processed look to his beard and hair. Later I noticed on US tabloids, that this, in a slightly less processed form, was his current look. I was not so distracted that I failed to notice how well he negotiated the task at hand. He was polite and respectful with perfect poise and seemed both comfortable and uncomfortable at the same time. He was a complimentary and thorough judge of the food. Whether all of this was genuine, or whether he was acting, it was exactly what the occasion called for and it was fascinating. Quentin Tarantino appeared to be completely at ease and a little hyper. He was enthusiastic about Japan and the food and completely without any appearance of self-consciousness. This man is revered by peers, and all I could think as I watched was that if this man could be so successful, perhaps there was a place in the world for me too. Perhaps his presence was also a performance, a perfectly balanced contrast carefully contrived to appear anything but contrived. The cooking show back story with the flower filled backdrop was both substantive and superfluous. The food appeared to be 5-star from both contestants, but unlike most Japanese cooking shows, the camera was on the guest stars as the subject for almost all of the whirlwind program. There was a cut away to a promo for the toy that shares one of the images with Tarantino above. I wondered if it was paid advertising. So far as I could tell, the sole prize for having won was promotional materials brought by Pitt and Tarentino. One of the rewards of international travel is that you get to see ordinary everyday things through he prism of another culture. This program was the mother load in that respect. When two cultures interact this way, it reminds me of opposing mirrors with infinite reflections. Two months later I still remember a marketing promotion sought out to pass the time in a hotel room halfway ’round the world.